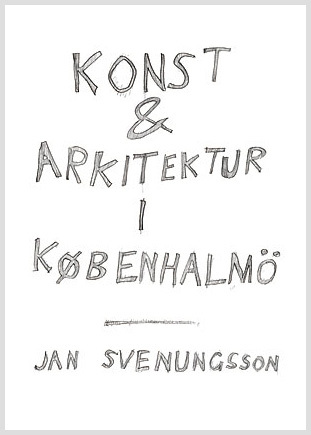 Jan Svenungsson - TAKE AWAY: "KONST & ARKITEKTUR I KØBENHALMÖ"
is the name of the book created for TAKE AWAY  an art project which took place between Malmö and Copenhagen - on the trains running over the new bridge  in September 2000. Artists JS., Ebba Matz, Erik A. Frandsen and Niels Bonde each created one artist's book of 64 pages (size 24x17 cm, 64 pages, full colour, edition 15.000 ), which were freely distributed on the "Öresundståget" run by Skånetrafiken and DSB in cooperation, between September 15 - 30. Each artist's book was distributed during four not consecutive days. TAKE AWAY was organised by Inger Tornberg and Patricia Asbaek in close cooperation with the artists. The project was supported by Kulturbro 2000, DSB, Skånetrafiken, Saloprint & City Reklame.